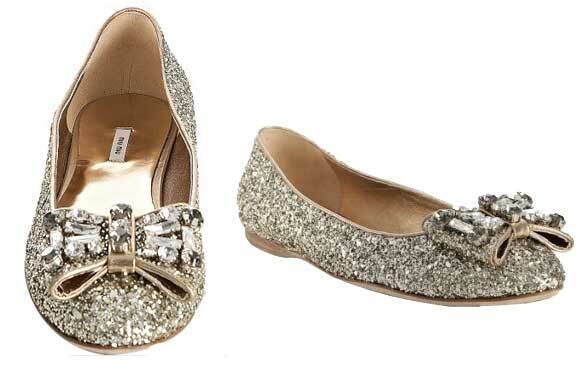 No one does glittery shoes quite like Miu Miu – and some of you may well feel that’s a good thing, given that these little Miu Miu flats look like they’ve been positively DRENCHED in glitter, as opposed to simply sprinkled with the stuff. Add some sparkly crystals on the bow, and you have yourself a totally OTT pair of flats that are almost guaranteed to be noticed wherever you wear them. These are currently on sale at Bluefly, but even the sale price is expensive at $500. Worth it, do you think? Well, I wouldn’t pay $500 for them, but I will confess to lusting after them a bit. Make them red and you’d have shoes straight out of the Wizard of Oz, though, which I would find even harder to resist! Exactly what Katy said. I do really like them. Not $500 worth of liking though. And yeah red would be immense. .-= Alex´s last blog ..Alice in Wonderland =-. Utterly adorable! Too expensive, but I do so want them. I don’t know why, and i feel like i shouldn’t, but i love these. I feel like they would be so multipurpose! with dark jeans for a dull day that needs to be brightened, and with a little dress for a party where you don’t want your feet to be killing you! .-= Ally C´s last blog ..Spring-Time Wishlist =-. I am seriously tempted. Is that wrong? .-= Tracey´s last blog ..Flowers =-.